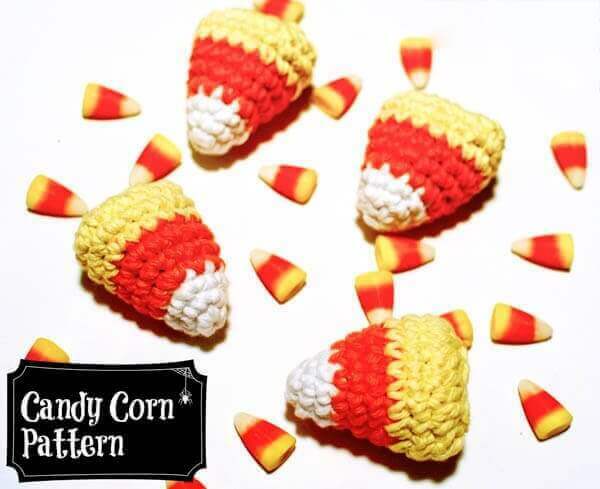 This crochet candy corn is a delicious little pattern and completely sugar free! Finished candy corn measures approx 2½ in. high and 2½ in. wide. Pull tail to close up ring and weave in to secure. Round 2: Ch 1, work 1 sc in same stitch as join and in next st, 2 sc in next, 1 sc in each of the next 2 sts, 2 sc in next, join — 8 sts. Round 3: Ch 1, work 1 sc in same stitch as join and in each of the next 2 sts, 2 sc in next, 1 sc in each of the next 3 sts, 2 sc in next, join — 10 sts. Round 4: Join orange, ch 1, work 1 sc in same stitch as join and in each of the next 3 sts, 2 sc in next, 1 sc in each of the next 4 sts, 2 sc in next, join — 12 sts. Round 5: Ch 1, work 1 sc in same stitch as join and in each of the next 4 sts, 2 sc in next, 1 sc in each of the next 5 sts, 2 sc in next, join — 14 sts. Round 6: Ch 1, work 1 sc in same stitch as join and in each of the next 5 sts, 2 sc in next, 1 sc in each of the next 6 sts, 2 sc in next, join — 16 sts. Round 7: Join yellow, ch 1, work 1 sc in same stitch as join and in each of the next 6 sts, 2 sc in next, 1 sc in each of the next 7 sts, 2 sc in next, join — 18 sts. Round 8: Ch 1, work 1 sc in same stitch as join and in each of the next 7 sts, 2 sc in next, 1 sc in each of the next 8 sts, 2 sc in next, join — 20 sts. Round 9: Ch 1, hdc2tog around, join — 10 sts. Stuff candy corn with fiberfill stuffing or yarn scraps. Push sides together and Sl st sides together using back loops only. Click here for more Halloween Crochet Patterns. Thank you for the free pattern. I adapted it by keeping it opened, making a button hole, button and stuffing with Halloween candy instead of foam. So far I have made about 20 and will make that many more. I have given them to people I visit, my scrapbooking friends, and will be making them for my Sunday School Class. I love them..They are so easy and fun to make. These are so cute…I really want to make some. But, I am having difficulty following this pattern. I am a newbie and need more practice. Thanks for such a cute pattern. I want to make a whole bowl full! These are so adorable! Now if I only knew how to crochet….I will put it on my “To-Do” list 🙂 Thanks for sharing and you have a lovely blog! Have a wonderful day. This would be so cute as an added bonus for trick-or-treaters! These are so adorable — and thank you for the pattern!